There’s a well-loved myth out there that if you do something reasonably remarkable and distribute passionate content, you’ll automatically have an audience who will support you in style for the rest of your life. You don’t have to do anything scary. Like sell, for example. Now if that works for you, that’s terrific. So does it? The painful truth is that there are lots of trusted, loved, and wildly influential smart people out there who are working like maniacs creating amazing content. And who are nonetheless still broke. It’s easy to think that if your audience loves you, all that love will translate automatically into paying customers. But if one of your goals is a financial payoff from your content, you still have some work to do. Your Aunt Frances loves you very much, but if you’re a Prius dealer and she’s more of a Lamborghini person, you’re never going to sell her a car. Your audience needs to both love you and want your product or service. They also need to be buyers. If your audience is made up of monks who have taken a vow of poverty, you have a tough road ahead of you, even if you could somehow demonstrate that driving a Lamborghini is actually a meditation with profound spiritual implications. Find out what your audience wants and what they’re ready to buy. Then build a product that meets their needs. Starting with the product and then trying to find raving fans for it is a rookie mistake, and probably the biggest reason small businesses fail. Now once you’ve found Aunt Frances a nice Lamborghini Gallardo Superleggera in racing yellow, she still may have some questions. She’ll have a tiny, little voice in the back of her head saying you might be less trustworthy, because now you have something to sell. She’s suddenly facing a dilemma. On the one hand, she loves you. On the other hand, you’re a scary salesperson. If you sell her something she doesn’t like, it’s going to mess up your relationship, and that’s the last thing Aunt Frances wants. The fact that she loves you doesn’t vaporize her sales objections. And it doesn’t mean she’ll blindly buy everything you put in front of her. Like the “self-cleaning oven” and “hot girls/guys are waiting for your call,” this promise invariably turns out to disappoint. If you run a business — or a nonprofit, or a political campaign, or a project where you’re trying to change people’s habits — you’re going to need to learn how to sell. Prospects have fears. Just like Aunt Frances, one of their biggest fears is feeling like a chump for buying from you. That’s why we communicate logical benefits and features — to calm the fear of feeling dumb. If you’ve created a relationship with your audience, you still need to address their fears and objections in a respectful way, or you’ll never be able to add a financial dimension to that relationship. All of us have a paranoid internal conversation running about what could go wrong, how the world might be trying to screw us, why we shouldn’t trust anyone, and so forth. This mental chatter gets louder when we make anxiety-producing decisions, like buying something we’ve never bought before. It’s your job to step right into the middle of that conversation and answer questions. Bring up every reason they might not buy. Air objections out, acknowledge them, and get rid of them by addressing them head on. If some objections remain unresolved, say so. Your product isn’t going to be right for every buyer; don’t pretend that it will be. Don’t just hope people won’t ask hard questions. Even if they don’t ask them aloud, those nagging worries are still chattering away in your prospects’ minds. Don’t (just) try to guess what prospects are worried about. Ask them. Ask what their biggest concerns are. Ask what’s making them nervous about their next car purchase. And ask what they’ve been looking for that they haven’t been able to find. You can create a survey, ask some smart questions in your email sequence, write a blog post, host a simple webinar, or just send a handful of tweets on Twitter and watch what comes back. Your audience wants to tell you about what they need in a ridiculously fast and expensive automobile. They want to tell you all about their frustrations with the McLaren they got last year and the fear that a Lamborghini won’t scratch that itch any better. If they’re in the market to spend six figures on an automobile, you’re the person they’ll want to buy it from. Wrap your message up with a strong call to action and a price that’s in line with what your market expects, and the race is yours. We all have that mental image of the legendary salesperson, the person who can nearly hypnotize people into buying. You don’t have to do that. Which is good, because it’s unlikely you or I will ever be able to do that. Instead, you’ll use empathy, respect, and natural conversation — tools you use every day — to encourage a new kind of behavior in your community. You’re not going to exaggerate your good points or offer crummy products, because that would screw up your relationship with your audience. And not only would that be a dumb business decision, it would feel really horrible. Ethical sales techniques work to make your relationship with your audience stronger than ever, while allowing you to make an honest and comfortable living. Want to improve your skill at selling (without feeling creepy or awkward)? If you want to get much more effective at selling, we’re putting together a powerful resource we think you’ll find helpful. We’ll specifically be talking about webinars — one of the most reliable ways to convert interested fans into happy customers and clients. To get all the details, click here and drop your information into the form. We’ll have more information coming for you next week! It never ceases to amaze me how many people start with a product and then look for a market; instead of the other way round. I know right! But hey I’ve been there and done that! An excellent post that makes some great points. These topics have been on my mind heavily lately. One of the fears/misconceptions that has to be dealt with after gaining acceptance in a community, is that you will lose it by default when you try to sell, or if you sell the ‘wrong product’. Thanks for a great post on how to navigate this early stage in online business building, Sonia! @Greg, that’s a big one, and one I personally know very well. It is scary, but you can move past it. While I have done a great deal of what most people consider “selling” it never feels like selling to me. I have always been fortunate enough to sell what I believe in and am passionate about, and I think that is one of the keys to success. I would never sell Aunt Frances on something that I’m not excited about and committed to, at the same time I think you need to be open about the possible risks associated with any sale. I like your approach to proactively addressing objections and being open with the buyer. I believe sales is about trust, passion, product and persuasion…. but you loose a big part of the passion component when you are selling through a brochure or webpage instead of in person. What can you do to bolster passion when communicating through written word? 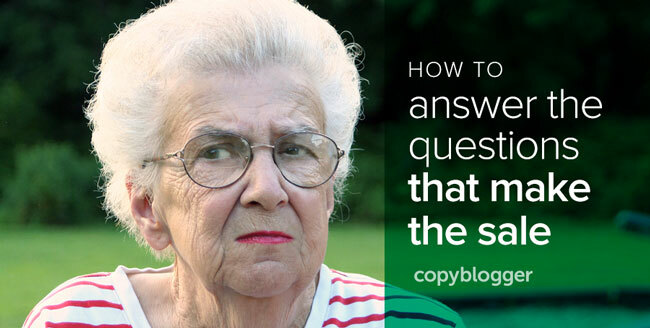 Another great post Sonia, I have a question as I’ve been experimenting for a while. I’ve sent over 300 visitors to Amazon from targeted review pages and am still yet to make a sale, even if people are clicking through I guess my landing pages aren’t good enough? Great post, Sonia. I’ve been giving this subject a lot of thought lately as I evaluate just what I want from my site. Thank you for giving me good words to chew on. “Sales Dogs” was a great book on this topic. Highly recommended. It would be an interesting thought exercise to try to take these concepts as you’ve described them and use them to build up an audience or subscriber base for a blog. The “product” is different, of course. I’m not quite ready to give up on the idea of a product taking off simply by being the better mousetrap, but experience tells us that normally only the most clever and lucky people succeed by doing that. Great post. Selling skills are THE missing link for many entrepeneurs. I wonder which of your writing recipes you used this time. great article! very good suggestions here. it’s a hard situation to deal with and i appreciate the insight! Interesting topic you choose. I don’t really think anyone is afraid to sell. I think that it is more of that people just don’t wanna put in any effort to sell. Too many times they want to go the easy route in my and hope the product just sells itself. But like you say, “there is no such thing as a product selling itself.” I know people wish that it was true but it is just not going to happen. I believe that you only have to put it few months of effort in trying to sell your product and then after that then your product might sell itself. He first had to get some people to know about your product otherwise how is it even possible for a product you create to just sell? Obviously I am just going on and on but I’m just trying to make a point. Put a little effort in selling your product. You have to address people’s fear and make a connection with them. Whether it is a big item purchase or having them join your service. People don’t want to be taken advantage of and to look like fools. If you can address that their decisions are the right ones for various reasoning, you will be able to convince them. I should have known it was you, Sonia. Great post! How easy it is fall back into the starving artist category when you’re just producing products all alone. Sales requires getting up and connecting to an audience. Thanks. @Ted, you might consider non-written content, like audio or video. Some people can get a ton of passion into their writing, but “copy” doesn’t just mean the written word. For some folks, going “multimedia” can get a lot more juice into their message. @Franklin, you might be surprised. A lot of bloggers would like not to eat ramen every night any more, but they’re really spooked about becoming salespeople, because they think selling is creepy or dishonest. Then there are some folks who just don’t know how the mechanics work. Excellent timing on this post, Sonia, since I am doing this very thing right now at Remarkablogger. I won’t try to sell it here, but check out the last few posts, starting on Monday, and you’ll see these steps in action. So far, it’s working great and I’ve sold more than I thought I would. Selling from your blog is an interesting challenge! I used to sell tombstones for a living (yes, tombstones). And every customer was treated with kid-gloves. I never knew if I was going to get a blubbering mess or a “I’m mad at the world” monster. But I treated each and every one with compassion…and instead of trying to sell, I gave them information. How the stone is made, the process from start to finish, etc. And I offered to write up a price quote so the customer could go and check our competitors. 98% of the time, they would sit right down and ask to buy right then and there. Thanking me for being informative and not pushy. Helping around the people by answering the questions on which the author of the site is having a great knowledge is another way to increase the interaction and loyalty. Well they will add value for the site/blog with possible publicity (even oral ) and will help in the long run. This is a great post, I myself am a very new blogger, have only had a blog for just over 30 days. I am struggling to find a way to monetize my blog, yet provide quality content that keeps people interested. It is a fine balance, I don’t want to be a typical blogger that will just post or jump at any sponsorship or ad content, yet I am looking to make money too, as we all need to provide for our families. When I review products, I always visit take the time to investigate it prior to reviewing or promoting it. If it is something I can’t find something legitimately worth while, then I will avoid the opp, or pass on the sponsorship. Ideally I would like to find only content that matches my blog’s content type but for now, I am picking what I can and trying to build a successful blog. Great post, and after reading it I will adjust how I try to “sell” content on my blog. I find it’s tough to shift gears from engineer to marketeer, but you’re right — it’s part of the job. I think it helps to have good role models and mentors. Keep it up. Thank you Sonia! I already have a product that answers the needs, but you’ve given me some great ideas for addressing the objections. I’ve never actually been able to grasp how to do that before – five years after going into business for myself one post finally turns the lightbulb on – you’re a genius! It’s a common mistake even among selling/marketing professionals to not confront all objections. When you handle these issues it isn’t hard-selling, which most professionals hate. I think selling should always be more like problem solving. Thanks! I have completely understood you. Though, my product is “Pune (India) real estate blog.” Sure, I can follow you and sell it effectively! @Bucktowndusty, thanks for the recommendation, I will check it out. @MichaelMartine, good going on the project! It’s definitely a different animal to sell from a blog and an existing relationship than it is to buy some traffic and pour it through a funnel. There are similarities, but important differences too. Well, Since I started to deals with customer online. Using Affiliate Programs to generating income. Most important point of sell to me is Landingpage. Hey your Post are really great and pointing for situation to do develop our sale. Great post. The most difficult thing is if someone has courage to even start selling whatever s/he has and keep the same energy level. Also, most people do not know where to get resources to support what they want to sell. @Tina, boy, selling tombstones ought to get hazard pay. What a great example of a time to step back a little and make space for what’s going on with your customer. @Alex, I always like when I can turn a light on! This one hit home. Thanks for a great post. I’m not a bad sales man, I just hate doing it and therefore I avoided to much. That’s a bad thing financially. So I better get started. WAIT! You mean my oven doesn’t really clean itself? That explains a lot. Jamie, you have my undying appreciation for noticing the one phrase in that post that consistently made me giggle. Thank you for indulging me. Great Post. Been in sales for over 20 years, and first time I have read what I have been trying to put into words for years. Nailed it right on the head. Now THIS post rocks. Great job Sonia. wowzer. @Doug, wow, that is a great compliment. Thank you. I’ve seen also that many bloggers give off such a timid vibe throughout the whole time they are building their blog. I believe this naturally attracts people who are not going to want to buy in the future. If you make it known from the start that you’re an entrepreneur and you embrace entrepreneurial principles, you’re more likely to attract people who are online buyers and repel those who aren’t. This is a great post. Finding a product to sell can sometimes be difficult, but I agree that too often people pick a product then chose a target. The image won me over. Didn’t even read the rest of the post. I’m all about selling that’s based on empathy and respect – and talking to people like they are actual human beings. And all this time I thought it looked like Herb Tarlek.